There are various ways in which people think of their cars: Some take it to be purely a means of transport from one point to another; some think of it as an extension of their personality, a sort of status symbol; others look at it as a comfortable and safe transport option for them and their family. When Mahindra & Mahindra launched Reva e2o in India last month, it got us thinking. It is a car unlike any in the Indian automobile market: It is small, looks quirky, and runs on batteries. Who will buy it? Why? What lifestyle will it fit into? 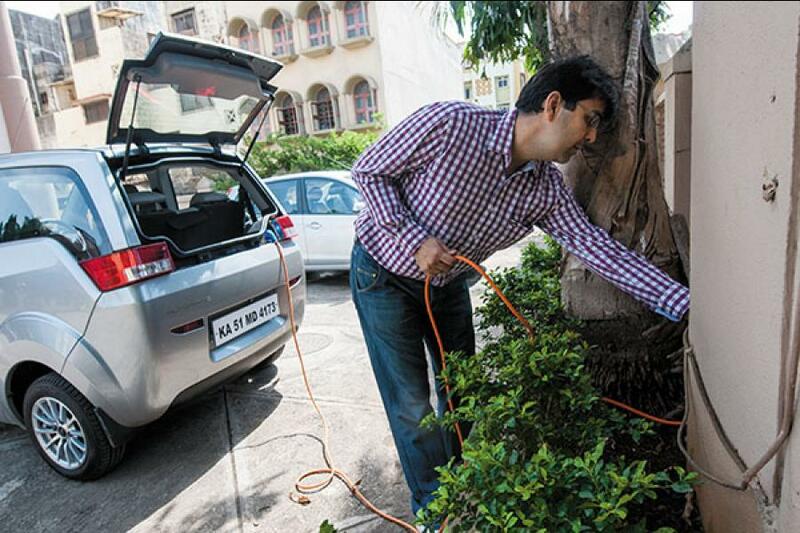 We put the Reva e2o in the hands of four people from Forbes India, each with a different lifestyle and requirement. Each person used the car for two days. 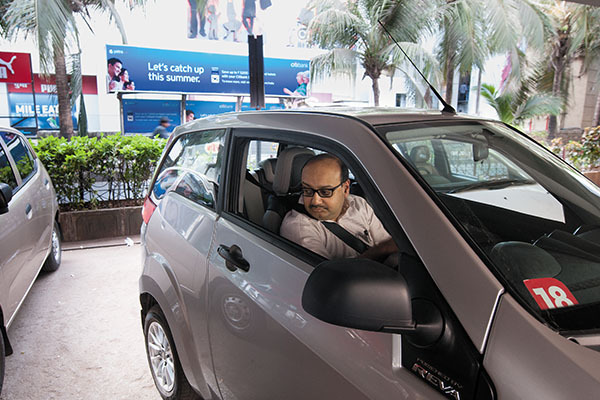 The reva e2o is a pleasure to drive—it is cute and a performer. A crowd puller, because of its novel design, it was a celeb on the roads. This automatic electric car packs a punch with its multiple features—an AC (the car doesn’t lose momentum or vigour while the AC runs), a radio, an LCD touch screen with digital display and a rear camera view of the car while reversing. The car has enough space to comfortably accommodate four people for a quick city drive and has adequate boot space for shopping bags. The best part about it was the stress-free drive through traffic. Smooth, effortless, simple mechanism, easy to maneuver and a nifty pick-up is how I would like to sum up the drive. I accelerated up to 90 kmph on Palm Beach Road in Navi Mumbai, and the car stuck firmly to the road, with no vibrations. Parking is much less cumbersome; you can find enough nooks and crannies to park, and rest assured it won’t be stolen as it starts only with its RFID key. The RFID key, however, makes it cumbersome to start. Sometimes the car wouldn’t detect the RFID signals; at other times I would have to restart the entire process. The brakes are really sharp. If you are speeding at 60 kmph or more and if you have to suddenly brake, you might just want to be careful. The car would screech to a halt even with a slight pressure on the pedal. Although the car tells you at the very start of the journey that you can run it for 99 km after a full charge, this can be deceptive if you drive with the AC or music switched on. My 30 km journey to office without the AC would leave a balance of around 69 km worth of charge, but with the AC switched on it consumed an extra 10 km to 15 km worth of charge. So, if you are planning a 99 km drive after charging it fully, budget for a maximum of 70 km with the AC running. The price, around Rs 7.4 lakh in Mumbai, is quite an ask. Mahindra & Mahindra also says the battery needs to be changed every four to five years, which may add Rs 2 lakh to the total bill. Now, an electric or non-fossil fuel vehicle should at least be lighter on the pocket for maintenance and running. Reva e2o disappoints on this count. I would love to do my bit for the environment but only if I am not bothered about what it does to my bank balance. Lifestyle: Travels to work mostly by public transport. Uses her car for local runs; has a dedicated parking spot in her housing society, but no charging facility. I drove the reva e2o for about 50 km, and loved the hassle-free drive, thanks to the automatic gear shift. When I got the car, it had enough charge for 60 km. I left office (at Lower Parel) early to beat rush hour traffic and reached home (in Malad, about 30 km away) with enough charge left for 24 km. The e2o is a crowd puller. A cab driver behind me was honking continuously. I let him pass. The next thing I know, he pulls up precariously close to my vehicle and shouts: “Ye battery pe chal rahi hai (Does this run on battery)?” I got quite a lot of attention, even from a guy driving a Q7! I made a quick stopover at a mall. The way to the parking lot is a steep incline and I was unsure if the e2o was up to it. To my surprise it did pretty well and I was quite impressed with its acceleration. The lack of power steering is a drawback. I found it difficult to take sharp turns and maneuver in traffic. The brakes are quite powerful and it takes a while to get used to it. I like the fact that that it is a very quiet car. The car is spacious enough for four people, but there is very little boot space. The touchscreen music system didn’t quite excite me. Charging the car was an issue since I don’t have any charging point at my parking space at home. But I got permission to park next to the security guard’s cabin, which has a plug point. Next morning, with the vehicle on full charge, I took my family out to Borivali (East). I am not a timid driver, and found the e2o fun to drive. On the Kandivali flyover I touched a speed of 87 kmph. The car was smooth, took the bumps pretty well, and stuck to the road. As the car picked up speed, there was an irritating hum. My family was pretty happy with the car. My mother, seated behind the driver, said there was enough leg space. I asked her if we could buy the e20. She promptly said, “Are you mad, where will we charge it?” Left to me, I am not sure about buying the car. Rs 7.4 lakh is a steep price. Plus, the additional Rs 2 lakh if you have to change the battery after every five years. Within Minutes of My First test drive, I realised the new Mahindra Reva e2o was an incredible head turner. As I drove back home from work—a distance of about 2.5 km—at every red light, people in adjacent cars would crane their necks to gaze inside the e2o. 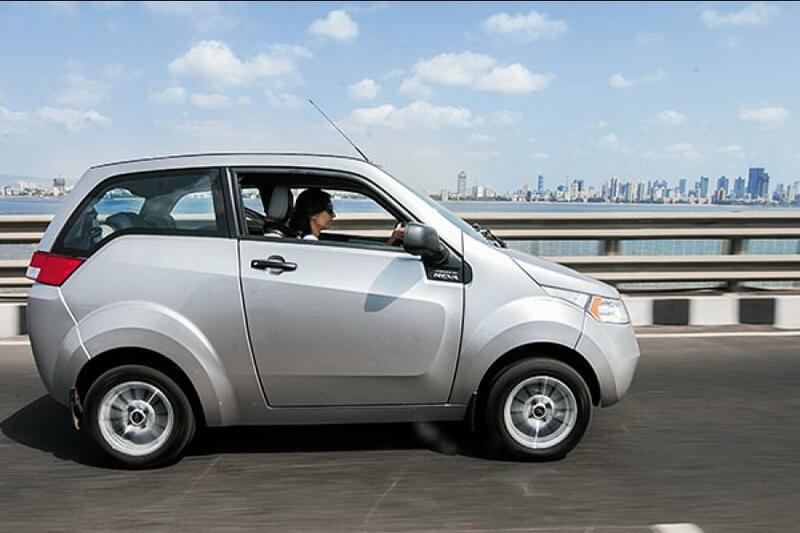 For one, the e2o, with its boxy shape, stands out. Plus, its novelty value is still high. Unlike Bangalore and Gurgaon, there are very few Revas in Mumbai. While Reva is the first electric vehicle I’ve ever driven, it isn’t the first small car I’ve owned. I have to confess I’ve had a long love affair with small cars. My first was a white Maruti 800 back in 1996; my next car was a gleaming red Daewoo Matiz. By the start of the next decade, we evolved into a two-car family. It wasn’t until last year that I decided to sell both cars and opt for a VW Jetta. Given our short commutes, it didn’t make sense to have two cars. However, the wife felt a smaller second car would have been more convenient, especially to ferry our kids to their dance classes and occasional birthday parties. Frankly, the e2o would have fitted that role perfectly. The issue was whether it was worth the money. I didn’t have very high expectations from the car, and was pleasantly surprised by its performance. It was pretty easy to drive, even in heavy traffic. But it took me about 10 minutes to get used to the automatic transmission—and the perils of driving with one foot. When I revved up the car on Worli sea face, the car managed a top speed of about 60 kmph. I was told it could touch higher speeds, but somehow it didn’t feel right to go any faster. I had also been warned about ‘range anxiety’. Knowing it is one thing, but experiencing it is quite another. The car had about 50 percent charge when I got it. By the time I had waded through evening traffic to my home in Worli, the meter had dropped to 40 percent in less than a kilometer. The next day, I couldn’t locate a charging point in our housing society, and the charge was down to 35 percent. The heavy traffic ensured I barely made it to office with enough charge left for about 10 km. I also discovered a peculiar phenomenon: Drivers of white Audis seemed to be rather jealous of the attention that the e2o got. On two separate occasions, I encountered an impatient Audi driver, who literally pursued me for almost a kilometre, loudly honking from behind. On the last night, I took the wife and seven-year-old daughter out for a spin. After the initial excitement of sitting on the back seat, I found my daughter unusually quiet. When we reached home, I asked her what she felt about the car. Her response left me stunned. “It feels like a limousine!” she said. The hyperbole apart, she wasn’t entirely off the mark. For most part, the car was unusually quiet, except the AC that made a bit of noise. So would I put money down for the Reva? At an on-road price of Rs 7.4 lakh in Mumbai, I think it is a tad too expensive. 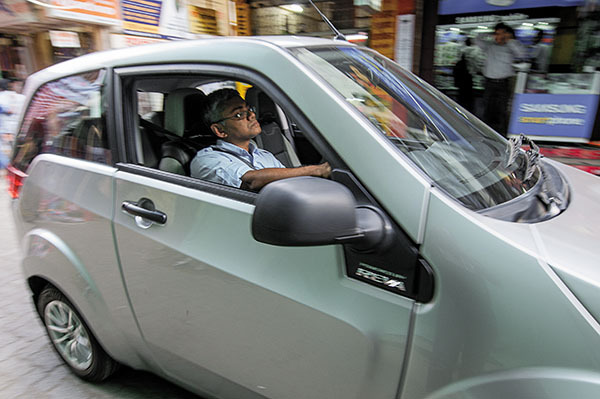 If the price comes down to around Rs 6 lakh—and the company installs strategically located super-charging stations that do the job in an hour—I’d seriously consider shifting to e2o for my commute to work and back. Lifestyle: Long commute; couple of meetings in the day; has a dedicated parking spot in his housing complex, but no charging facility. 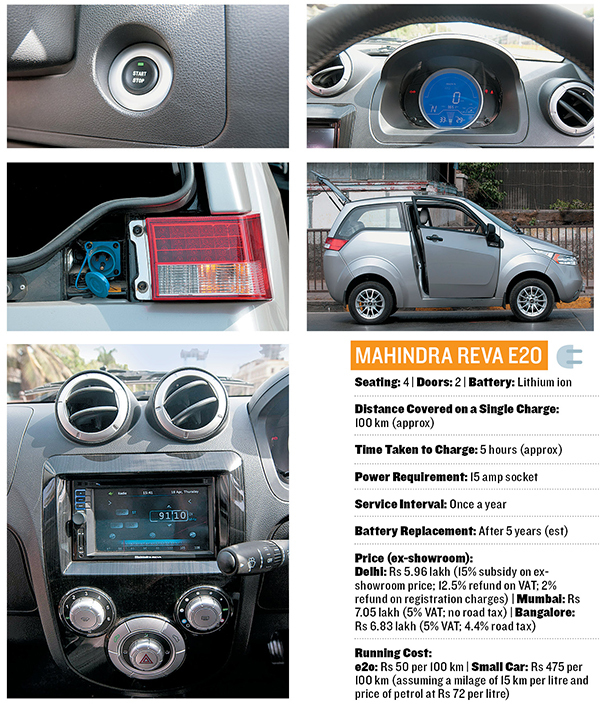 The one thing you have to say about Reva e2o is that it turns heads. Nearly all children and random motorcycle riders looked at the car. E2o is a pleasure to drive for most parts. Since it is an automatic vehicle, driving is easy. The wonderfully smooth motor response allows you to drive in an unhurried manner. One of my favourite parts of this driving experience came on Mumbai’s Western Express Highway, which has three flyovers with steep gradients. I would start my climb at 35 kmph or so and then floor the pedal. E2o delighted me while accelerating through the climb to the top. I was doing 65 kmph to 70 kmph when I finished the climb. Heading towards Worli Sealink, I was able to get the e2o all the way up to 89 kmph. It couldn’t maintain that pace and dropped down to about 85 kmph and held that easily for about a kilometre. With that sort of power, the e2o easily held its own against more powerful cars on the open stretch. The real pleasure of driving the car is like listening to the great classical singers—be it Pandit Bhimsen Joshi or Ustad Rashid Khan—and their fidelity in the lower registers. I went to Ranade Road, one of the busiest streets in Mumbai. There is no way an automobile can move faster than 5 kmph. It is here that e2o, with its precise motor, made driving effortless. I was even able to observe and absorb some of the bazaar’s intensity because driving was easy. While driving the car the battery lost one unit in the Distance-To-Empty (DTE) for every kilometre I travelled. I usually got a top-up charge of about 20 percent at a local garage, so, no ‘range anxiety’ because I knew there was a charging station at Mahindra Towers at Worli, close to my office. The one big challenge I faced was the brakes: They are extremely powerful and managing it in stop-start traffic can be a little painful. Would I buy the car? No. Would I like to drive it? Yes! My reasons for not buying it have nothing to do with how it drives. For a family of four the car is quite cramped, with virtually no boot space. For someone like me, the e2o will remain a car that I would want my richer brother-in-law to buy so that I can borrow it over the weekend every once in a while!